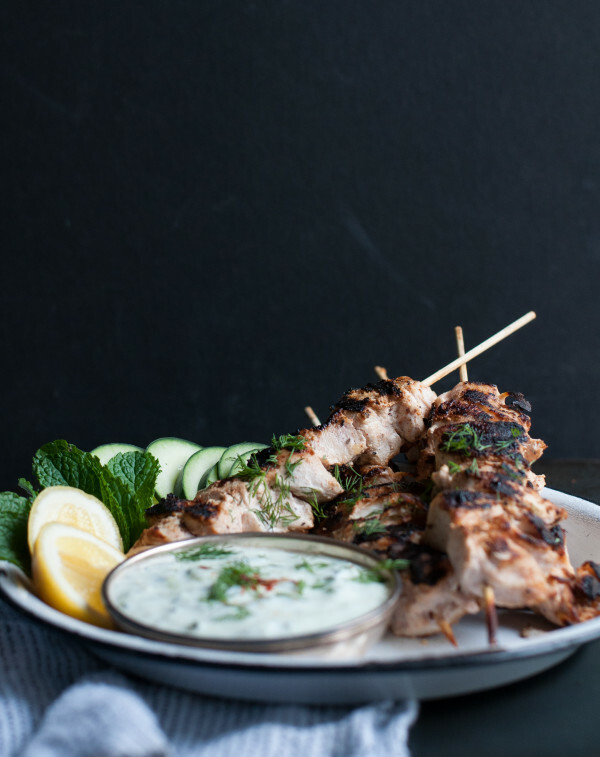 A lot of the Middle Eastern/Mediterranean cuisines marinates their meat (especially chicken and lamb) in yogurt and it transforms it into juicy and tender goodness. To me chicken can be so boring and tasteless. It is the easiest thing over cook and there is nothing worse than an overcooked piece of chicken that is dry and stringy. But yogurt changes all of that so I decided to create my own easy and simple version of yogurt marinated chicken. So lets talk about why this works. Inspired by Harold McGee (if you don't know who he is, he is basically the master of science and food. His book was our "textbook" in cooking school) I decided to do a little research. It all boils down to lactic acid. I know what you are thinking - that sounds gross, why would I want to cook with anything that lactic acid in it! Well trust me it is a good thing. The lactic acid helps to tenderize the meat which in turn makes it juicy and tender, the way that chicken should be. (Also side note if you think about it, other types of dairy like buttermilk or sour cream have lactic acid in it as well and both of those create tender baked goods.) Plus who doesn't always have extra yogurt hanging out in their fridge. Put it to work! So here is my take on yogurt marinated chicken. I threw in some tzatziki which is a mixture of yogurt, cucumber and lemon juice, well because it is delicious and I love any meal that comes with a side of dressing, topping or good old-fashioned schmear. In a large bowl combine 1 cup of yogurt, paprika, sumac and a large pinch of salt and pepper. Add chicken, stir well to combine then cover with plastic wrap. Refrigerate chicken and marinate for at least an hour. While the chicken is marinating make the tzatziki by combining the remaining yogurt, grated cucumber, lemon juice, dill and a large pinch of salt and pepper. Thread the marinated chicken on the wooden skewers. Grill chicken for 8 minutes if using breast meat and 10 minutes if using chicken thighs. (or if you have a digital meat thermometer until it reads 165°F. ) Let chicken rest for 5 minutes. Serve chicken warm with a dollop of tzatziki.